boxes will contain more than $5M or above in each. If you are not in agreement with this proposal, please disregard it. Subject: Re: Your Abandoned Consignment Ready For Claim!! If you are not ready to receive your consignment now that we are here i doubt when you will receive your fund, what i will promise you is that i will never fail to bring your fund as agreed as soon as we pay the non-inspection fee of $1,850 as i will personally bring it to your doorstep with my immunity coverage as a UN inspection expert. This Non-inspection charges of $1,850 is the only fee we have to pay and i will bring your consignment to your doorstep, So i will like us to share this fee into two where you pay half and i will pay half of the fee so that they will know you are aware that your consignment will leaving to your address. At this juncture i will like you to tell me how and when we are going to pay the non-inspection fee of USD$1,850 (You Pay half and i pay half) and when you will be sending your own part so that i can notify airport authorities here as only me cannot pay the complete fee, there is no time to delay any more as we will be leaving here by Wednesday next week as we have another inspection assignment in Montreal Canada next week, So the early you understand this, the better for you. listen to me, i have told you everything you need to know about your abandoned consignment in our custody here and it is my wish that you receive your funds and start a new life but since you don' t want to assist me to pay part of the non inspection charges so that i can bring your funds to your doorstep, i will have no other option than to submit all the documents backing your funds and our inspection report back to the government to enable government go ahead and confiscate your funds. 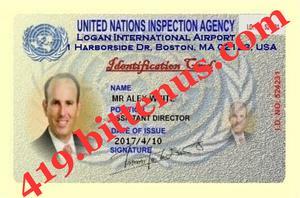 You cannot because of your past ugly experience and lose this opportunity especially now that am in a position to deliver your funds to your doorstep without any hitch from anybody because i have immunity as a united nations forensic expert. There is no need of over arguing this issue here because i have told you clearly that the government want to confirm from you that you are alive through the payment receipt that you will send and that is why i asked you to send $ 450 while i assist you pay the rest and i will bring your funds to you and you will start a new life and pay all your debts. I have delivered funds to a beneficiary like you in China, Germany, Canada and all the rest and noting will stop me from delivering your funds to your doorstep. I will advise you to give this opportunity a trial and you will never regret it because i too need this money and it will pain me if you lose this funds because your funds is legal and you have right to claim your funds because all the 21 hard copies of the whole documents are all in your name, So think about this golden opportunity before the end of today to avoid you losing this funds as time is no longer our side and it is only today and tomorrow we have to compile our report and submit to the government. Remmember a stitch in time saves nine and the earlier you do something about your funds, the better for you.